"when you stop looking for it, it finds you"
That's what everybody says about love; that when you stop seeking it out it will just sort of stumble into your lap, and I think its true. On January 24th of last year my mom gave me a poster-version of this painting as a birthday present, its by one of my favorite artists and I just fell in love with it. I loved it so much that I wrote a blog post about it and said "Pictured above is a painting my mom got me for my birthday, done by my favorite painter Brian Kershisnik. Written above the woman's head are the words "I Can Hardly Believe This" My mom jokes/half wishes that someday a man will come along and sweep me off my feet, I'll lose my wit and my clever comments, my sass will dissolve and I'll go weak in the knees in his arms. This idea is a darling one. The caption above the woman's head easily capture what I'm sure my thoughts will be when this does indeed happen. What a lovely gift." My mom was on to something. It was just a few weeks later that I met Kory and everything just happened. I still remember the first time I ever saw him, what he was wearing, and our first conversation as we stood side by side in an elevator, dropping eight floors. I remember calling my mom just after our conversation had ended and telling her how handsome he was. I was weak in the knees, I was giggly and silly and completely twitterpated, but it was more than that, because it was the real deal. The "can't eat can't sleep, reach for the stars, over the fence, world-series kinda thing." And I really couldn't believe it. I don't know how, probably just mommy-instincts, but my mom just got it. She brought up this whole occurrence the other day and she said "I just knew you really wanted somebody, when I saw the painting I knew it was what you wanted." She was right. She's always right. I wanted the every-day kind of love. 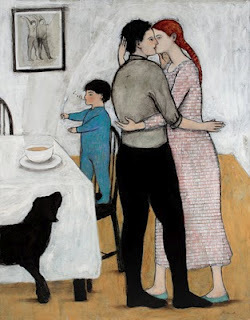 The kiss-in-the-kitchen-while-the-kids-eat-soup-and-the-dogs-bark-kind-of-love. And I found it. Or it found me. Its funny to look back to a time when I wondered who the man in the painting would be and now to look at my sweet husband and see that he's better than any of the lists that I wrote, better than what I imagined he could be and more perfect for me than I knew was possible. And to think that all I had to do was stop looking. You are lovely. Thank you for quoting "It Takes Two". Oh yes, I'm officially addicted to your blog.